If your hot water heater is 10 years or older, you could be enjoying hot water on borrowed time. The average life expectancy is 10 – 15 years depending on the type of system and the quality of the equipment. Even with regular maintenance, your water heater could be running inefficiently. Hot water heaters are more energy efficient and environmentally friendly than ever before. Updating your old system could save you a lot of money on your utility bills. We are highly knowledgeable with a large range of hot water heaters including standard tanks such as electric or gas as well as the newer tankless systems. If you need a new water heater, we can suggest one that best fits your lifestyle and hot water needs. At Harris Heating and Air Conditioning, we recommend regular maintenance even if you have a newer hot water heater, or water heating system. Regular maintenance can ensure that your unit is running efficiently and safely, prolonging its life. Water heaters that are not properly maintained can become clogged, resulting in lower temperatures and restricted flow. Gas heaters can also be at risk for producing carbon monoxide. Tankless Water Heaters provide an endless flow of hot water. Tankless hot water heaters are becoming more and more popular. They can supply an endless flow of hot water and are much more energy efficient than the standard water heater. Although the initial cost is higher, the system will result in greater savings on your utility bills. 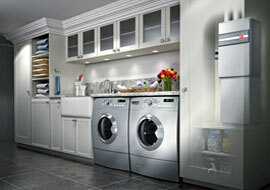 We carry both gas and electric tankless systems. If you’re thinking of switching to a tankless water system, our technicians are more than happy to answer your questions and help you decide if a tankless water heater is right for your home. If you prefer to rent a water heater, Harris Heating and Air Conditioning can provide you with a water heater rental that will keep the hot water flowing. If something ever does go wrong with your heater, we’re the ones responsible for repairs and maintenance. We install water heaters from only top-quality manufacturers and our rental service is guaranteed.